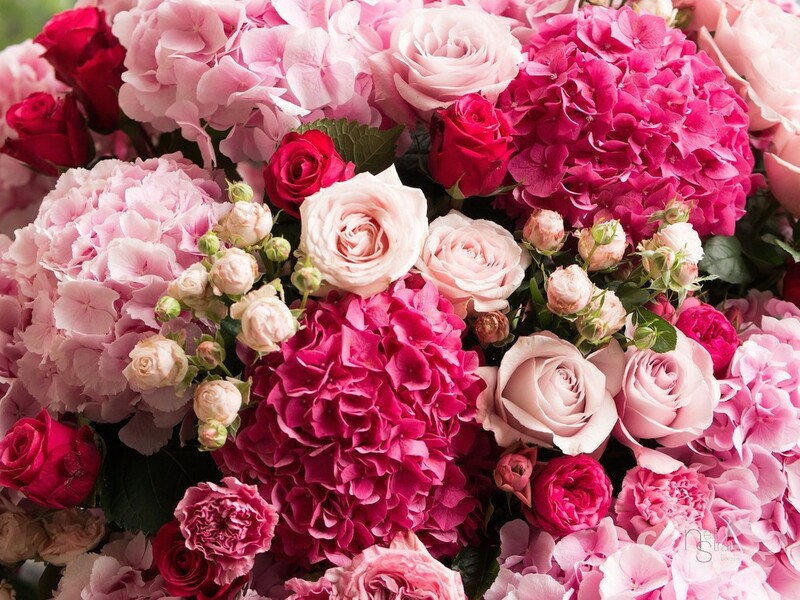 There is rarely a better occasion to showcase a floral designer's work than a luxury wedding. 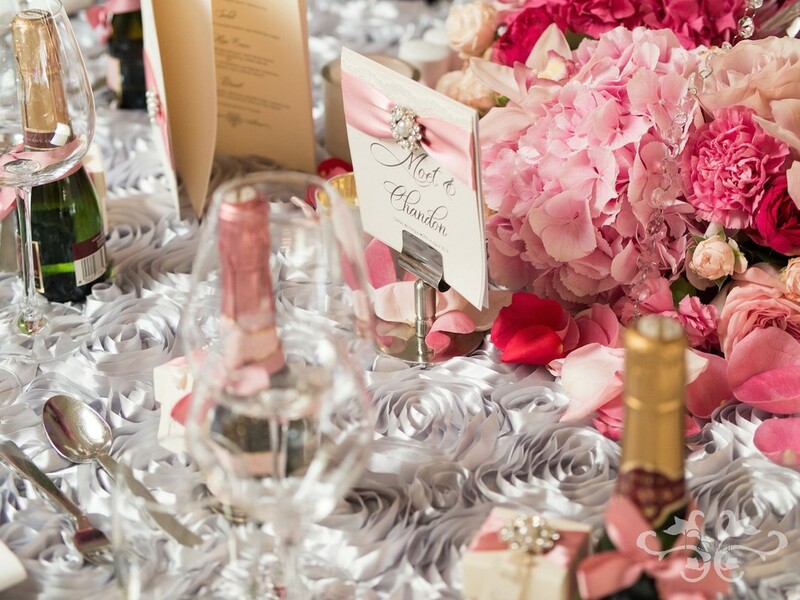 Which is why I am introducing my new blog dedicated to our wedding and event work. Given my Irish roots, it's hardly surprising I would like to feature foremost a truly magical wedding that took place in my home country last summer with all the fairytale fantasy of a famous Irish castle. Lough Eske Castle in Ireland. The perfect setting for a fairytale wedding. The most romantic and dramatic moment of a wedding - the heart-stopper and tear-jerker - is of course, the first glimpse of the bride walking down the aisle. But there is another moment of drama when the bride, groom and guests arrive at the reception. 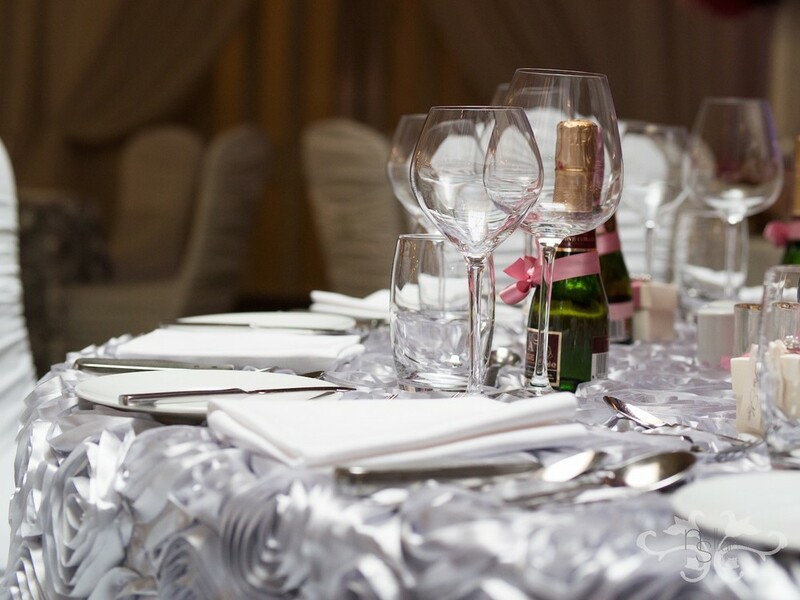 Decorating the reception venue is like a theatre production, starting with the brief from the bride to create a setting that will convey the desired emotion and style of the couple, designed with every detail to be admired from the back of the house to the front row. When it comes to setting, few places can rival the beauty of the historic Irish castle of Lough Eske in County Donegal. It’s been voted the ‘World’s Best Luxury Country House’ for five consecutive years and won numerous Conde Nast Traveller awards for its service and discreet luxury. So when I was asked to design the wedding flowers for such an impressive venue it was both inspirational and challenging. The imposing Tudor Baronial Castle is set in manicured grounds and combines an historic past with contemporary elegance. 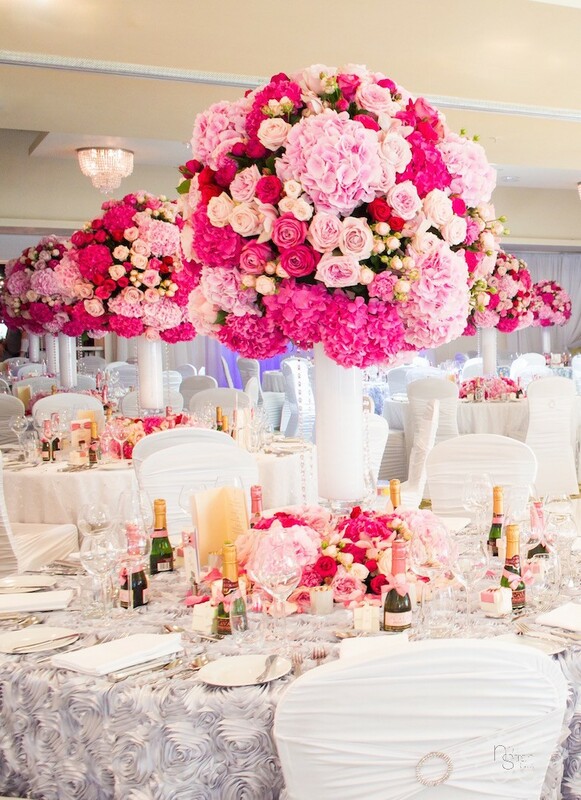 Likewise the bride wanted to combine her own innate sense of style while remaining true to her love of all things pink. She wanted the ‘wow’ factor and I think you'll agree from these images she got it! Prior to the big day, my team and I spent a week close to the venue, not just prepping the flowers and securing the mechanics, but making site visits, checking my sketches were in perfect proportion to the interiors and ensuring we were true to our mood boards before finally creating the designs. 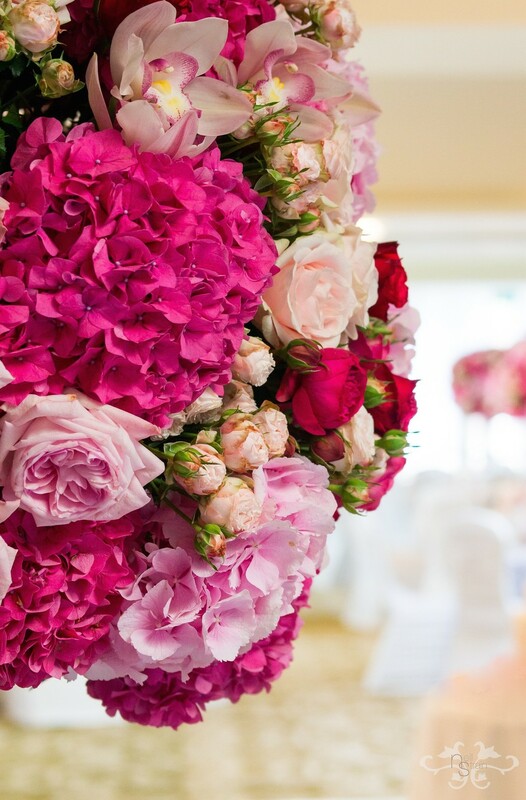 We chose a red carpet entrance so that guests arriving along the sweeping lane that leads to the Castle’s main entrance were greeted in style with two tall urn arrangements in harmonising pink blooms – a foretaste of the ballroom’s décor. 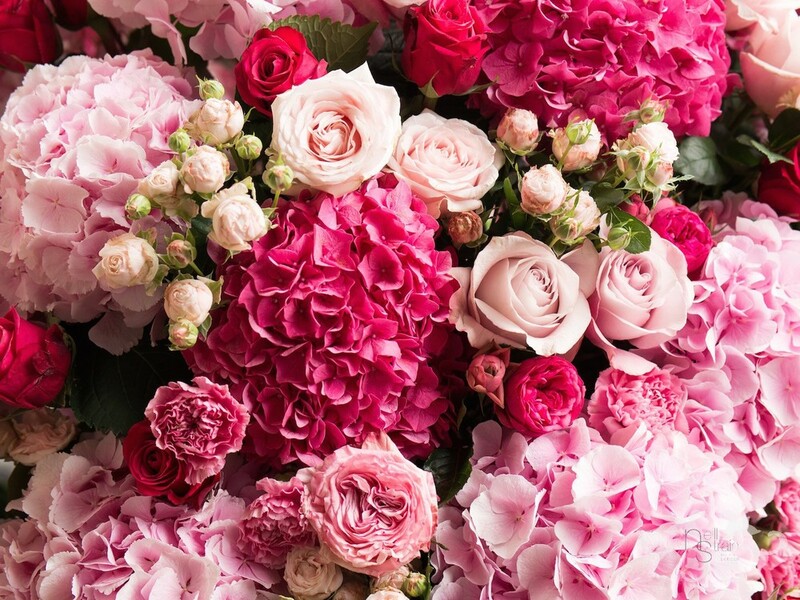 Impressive spheres of huge Hydrangea heads in hot and soft pinks, old fashioned Garden Roses, delicate spray Roses and Dianthus connected with a moss garland to a bed of Rose, Lavender and Kalanchoe plants below. Rose, Lavender and Kalanchoe plants in a bed of moss enhance the base of the Urn. This grand display framed the castle steps that led on to a petal-strewn doorway and into the main ballroom. The setting proved to be a popular photograph backdrop yet was just a foretaste of what was to come. Our piéce de resistance was the castle’s ballroom which hosted 300 guests that evening. 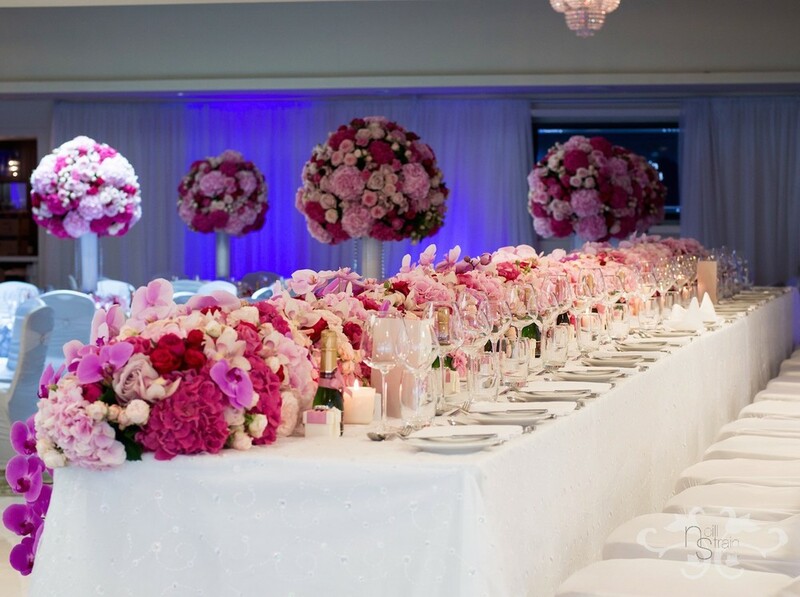 We dressed 30 tables with sparkling cloths (in reference to both the bride’s gown and the invitations) and decked them with fairytale table centres in the same pink colour scheme and flowers as the entrance. 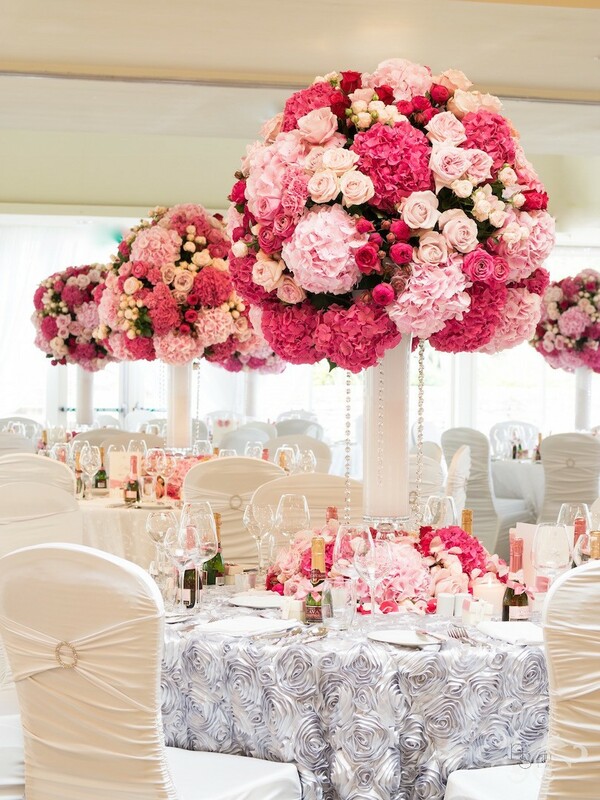 The different tints, tones and textures of the table decorations transformed the ballroom into an enchanted summer garden, light and playful, magical and emotive. For the top table, with a touch of the quintessentially Neill Strain opulence, we added trailing stems of Phalaenopsis Orchids to the Hydrangea and Rose base. As a refreshing contrast between the entrance and the ballroom, we pursued the garden aspect of our bride's brief for the other reception area in the Castle. We painted terracotta pots in soft pastel colours and arranged them with more Lavender, Rose and Kalanchoe plants on the white wrought iron tables. Just in case the scent of our Garden Roses wasn't enough, I commissioned from our Belgravia neighbour and chandler Rachel Vosper, bespoke fragrant candles - a divine combination of Jasmine, Magnolia and Rose - and as the day gave way to evening, their flickering light sparkled on the crystal glasses and garlands hanging elegantly from the centre floral spheres. The most magical moment of the wedding for me, and I'm sure for any floral designer, is the astonishment and awe you see in the bride's face when she first walks into the room. 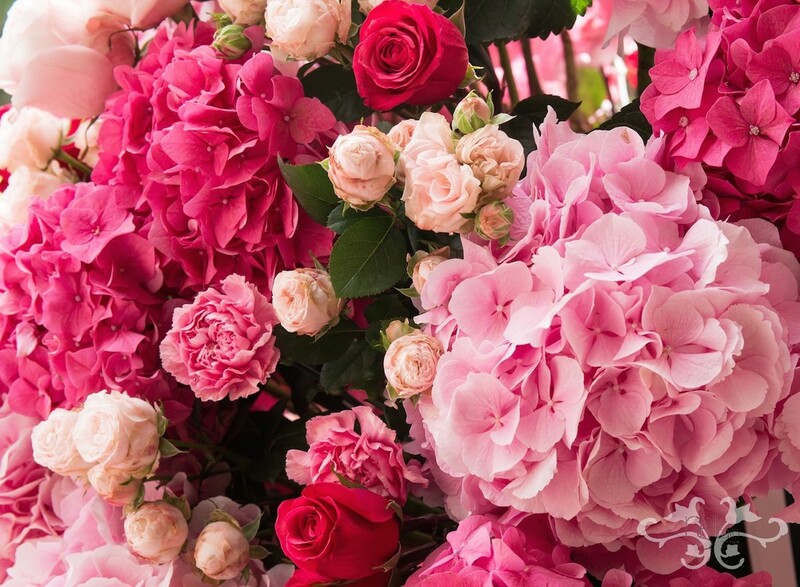 Her surprise, delight and even tears means you've done a great job, that you've captured her vision and helped make the most important day of her life be everything she hoped for. I hope you've enjoyed a glimpse of what was one of my favourite weddings and just in case you're wondering what the church decorations looked like, I will share these images in a future blog. All photography by John Nassari.